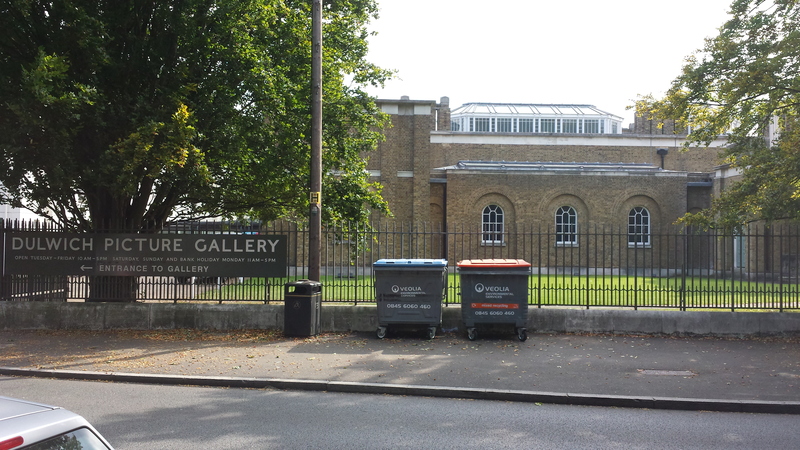 Gallery road entrance; shame about the bins! 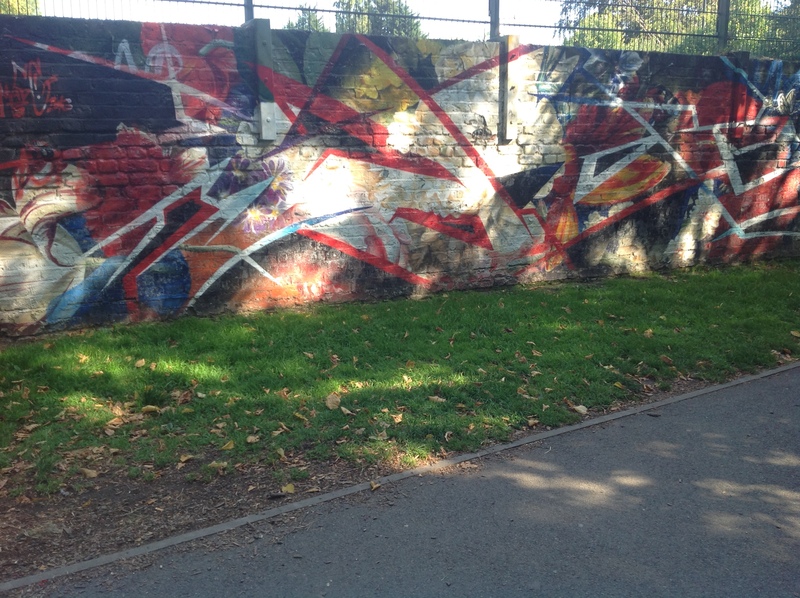 I started writing this post, intending to cover the complete Dulwich Street Art tour in one but I have realised this needs to be broken into two or three separate posts. This, therefore is post one. The rest will follow shortly. 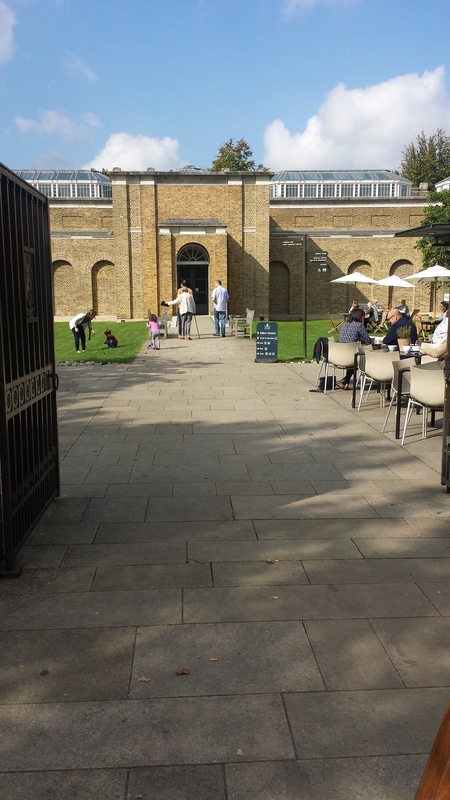 The Dulwich picture gallery is, apparently, the world’s first purpose-built public art gallery, built in 1817 by Sir John Soane, who was also responsible for the Bank of England. I’m fortunate to live a mile from its front door. 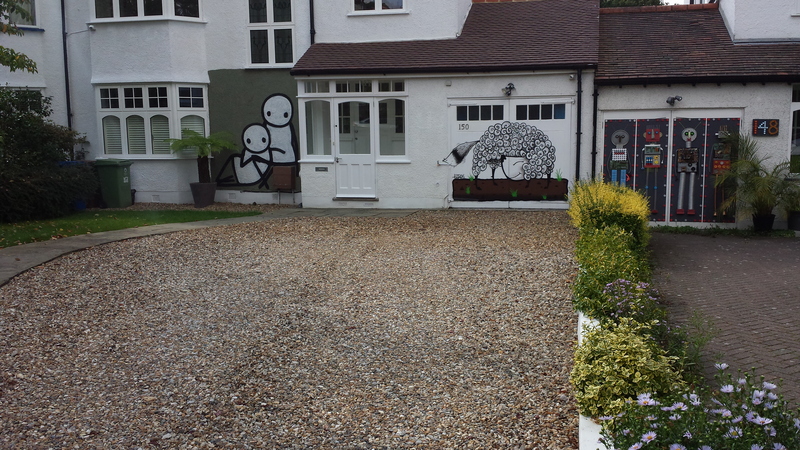 It is in the middle of Dulwich village, 5 miles from the centre of London and part of a green and cultured oasis. 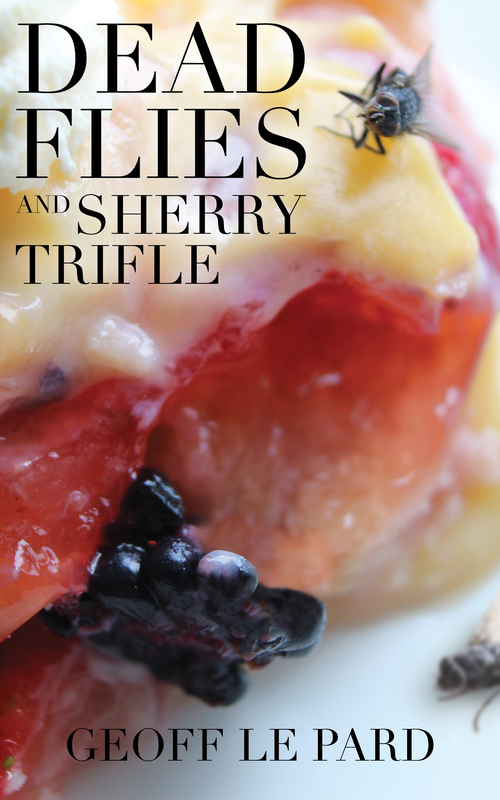 All of which rather suggests a collection of Tweed wearing, Telegraph reading oldies – fusty and set in their ways. The gallery has done its best to temper this image with some recent exhibitions but since it was built to house a collection of Old masters and is more famous for the Baroque than Brit Art, it is difficult to shift the typecasting. Last year, however, in May 2013 and as part of the Dulwich festival the gallery commissioned some of the biggest names in street art to reinterpret some of its paintings on the walls, lamp-posts and pavements of Dulwich and Peckham and thus to create a vibrant outdoor gallery. 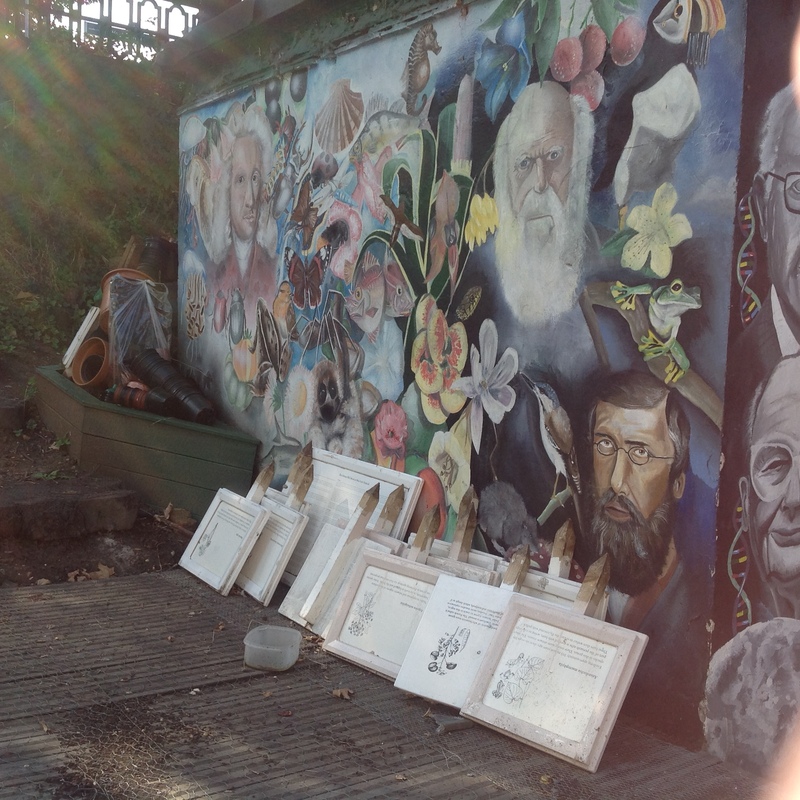 I’ve already written about street art in London and it is becoming something of a passion. It combines my love of walking with my delight in my city and adds to the mix the indescribable joy (ok, that’s a bit o.t.t. – a tingle of satisfaction) that comes when I find art in unexpected places. It always brightens my day to imagine the artist taking a drab, utilitarian flank wall and making it rapturous (here we go again – typical blather). Anyway, I’ve had the interactive map that I’ve linked above on my ipad for a while, wanting to find the moment to use it, to see which of these commissions remains intact. 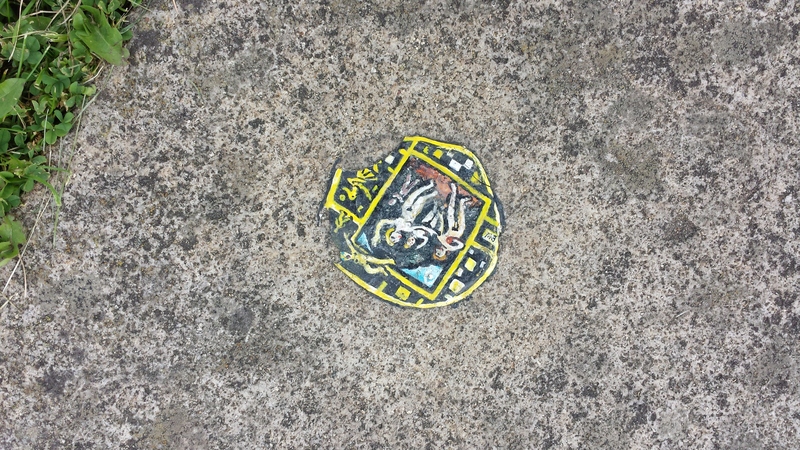 Street art is intended to be ephemeral, to be painted over though I suspected these works would be treasured. Or would they? Which would survive and which would have gone? I was in for some surprises. The Textiliste is the real art lover and a fellow walker of some commitment. Dog likes walks. He’s not big on art, to be fair. He did try and pee on a Delgardo which I thought might in fact be a fair comment on some street art (though not Delgardo’s). I had no idea how long the tour might take, how far indeed it might be. But it did occur to me that others might come across this post and want to follow it so I will try and explain what we did, where we went and the options open to the potential Street Art Lover. First things first, I didn’t actually go this route but to make it as user friendly to the non Dulwich resident as possible, this is how I would have gone, had I come into the area specially. 1. Start at Gipsy Hill rail station. First, there are trains from London Bridge and Victoria (about 25 minutes each) and second there is an outlet of Brown and Green’s café, a local business run by twin sisters and capable of providing the greatest bacon baps in South London. Left out of the station, down the hill to the Paxton. On the side is a mural by Reka based on Europa and the Bull by Guido Reni. 2. From here you continue to Alleyn Park and head north. At the Alleyns’ Head pub, go right ahead down the path alongside the railway line until you reach West Dulwich station. If you want to cut out the mile walk from the Paxton, catch the number 3 bus to the end of South Croxted road. 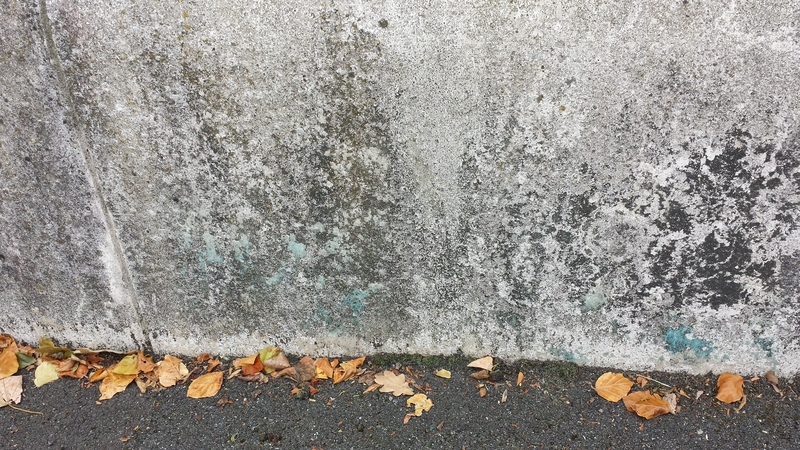 Either at the bus stop or the station head east along the south circular under the railway bridge. 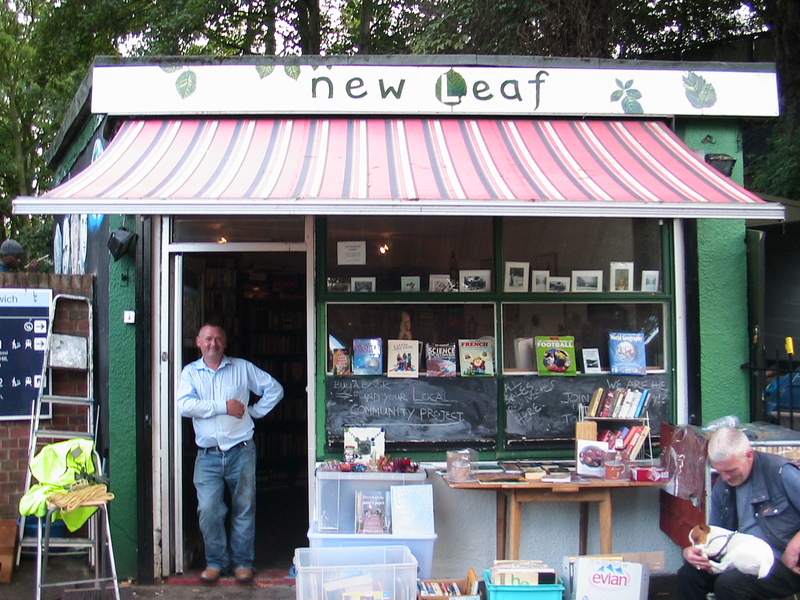 Immediately under the bridge on your right is a lovely little community project run by Vinnie, called New Leaf. Do stop and chat if they are open. 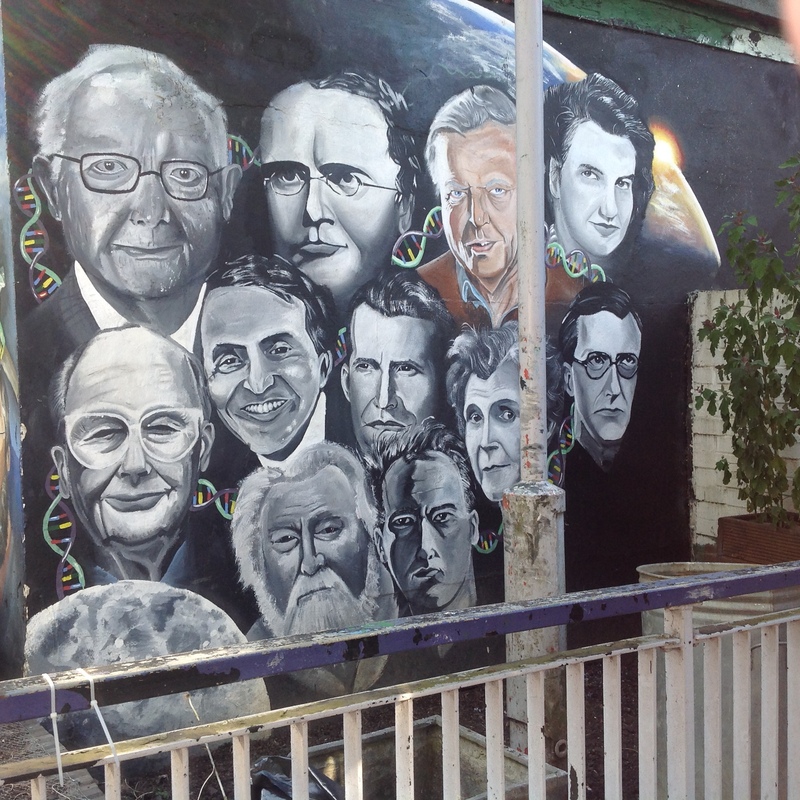 If not have a look at the murals that Vinnie commissioned of some of his favourite scientists and botanists. See how many you can name. Just don’t mention Watson and Crick. 3. Cross the road and enter Belair park by the gates next to the tennis court. Immediately inside, on the practice wall is MadC and his take on a Dutch flower painting by Van Huysum; possibly this. Mad C. This is the only work with a note next to it explaining its genesis. Only a flimsy piece of paper so it will not last. 4. Belair Park can provide food at Belair house though this might be too soon after the bacon bap and is a bit posh. There are public toilets inside the park, just before the House – usually pretty clean. Having refreshed etc, exit onto Gallery Road. You have a choice. 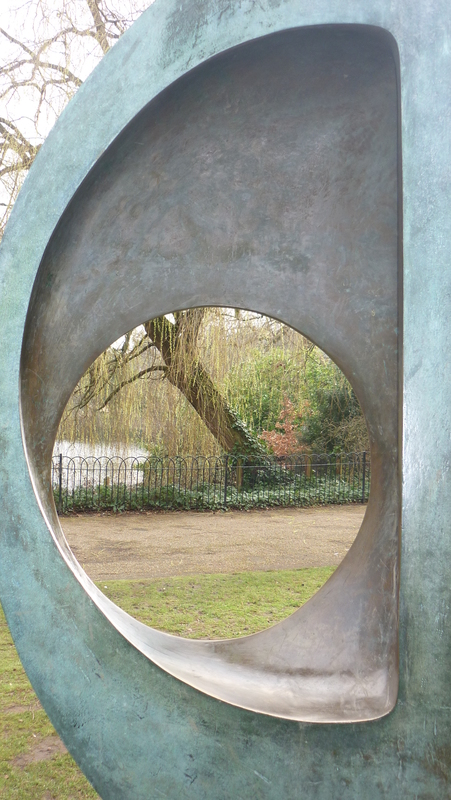 Cut through Lover’s Walk to College Road and turn left to the Picture Gallery main entrance or continue left up Gallery Road to reach the gallery by cutting through their gardens. Here is the first disappointment. According to the interactive map there are three works, a Patrick Delgardo and two Ben Wilsons. 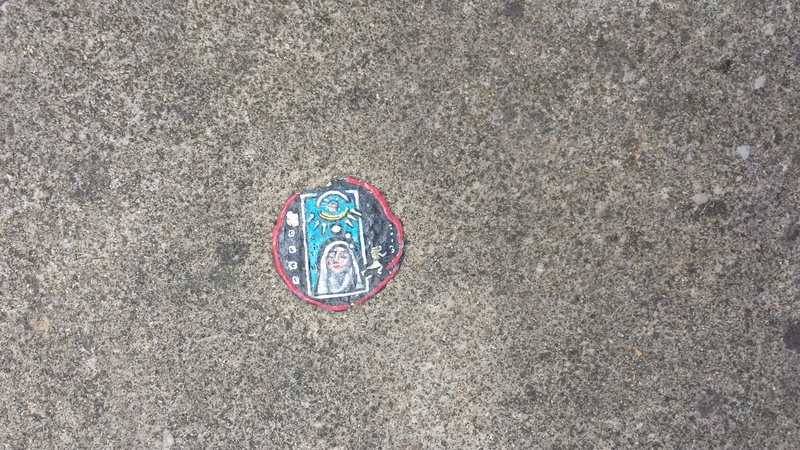 Ben Wilson is the chewing gum artist so, inevitably he is difficult to spot. His two items are by the bike rack, just inside the main gate by the café (first picture below – based on Saint Catherine of Sienna by Dolci ) and the second by the bench between the gate and the main entrance to the gallery based on the Judgement of Paris by Van der Werff. 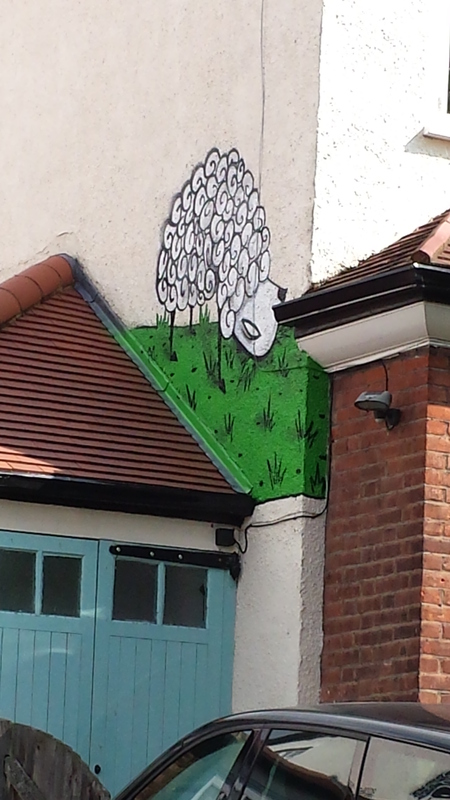 The Delgardo, who is a poster artist, working on a small scale, has pretty much gone – it was on the wall on Gallery road in front of the old cottage. The third picture below is of the small residue. Ben Wilson no 2: apparently Ben thinks if the women are naked then so should be Paris. 5. After this little struggle to find the Wilsons the next two were easy. If you haven’t had a coffee the Picture gallery café is fine if pricy. There are toilets just inside past the café till if you need them. Refreshed head back across College Road and into Dulwich park. You need to go straight ahead when the entrance road ends by the barriers, between the shrubs and with the boating lake on your right. 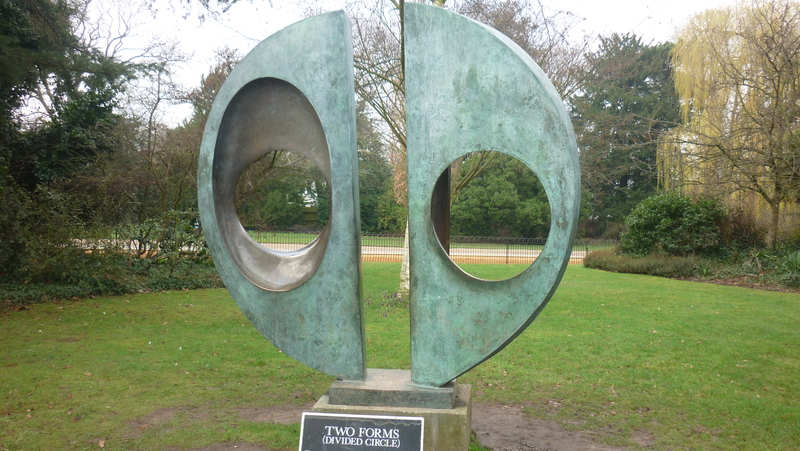 I’d love to send you on a detour to see the Barbara Hepworth sculpture but it was stolen, no doubt melted down and the promised replacement has not yet appeared. Here are a couple of photos we took before the dastardly act. I’d like to say it is hard to understand the thief’s mentality but there are desperate as well as greedy people in the world so maybe I should try and understand. But I can’t. BASTARDS. The next two are on the Bowling Club house (pass by the café for now) and we come across our first Stik and a Thierry Noir. The Stik interprets Three Boys by Murillo and the Noir is Joseph receiving Pharaoh’s Ring by Tiepolo. 6. You need to circle back to the crossroads and turn right for the Court Lane gate; if this is break time the Park café do great coffee and decent bacon rolls. Their cakes are pricey though. Hidden in the shrubs to the left of the café are public toilets and these are generally in acceptable condition. Out of the gate and right onto Court Lane. 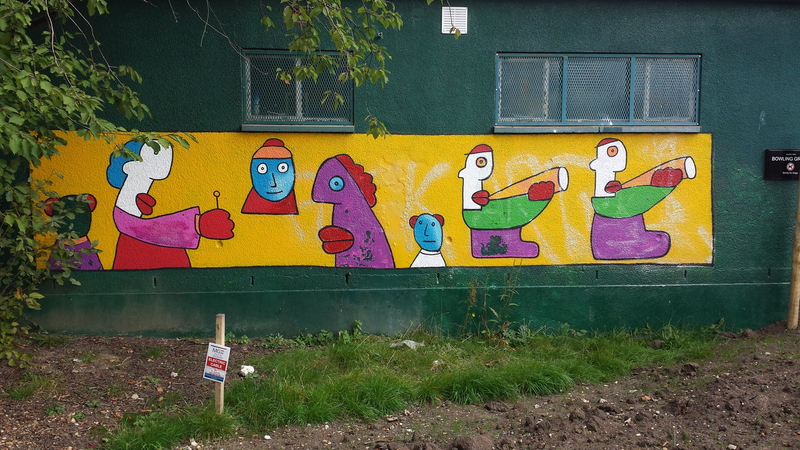 The first of four paintings in Court Lane is on 150 (the park side of the road). 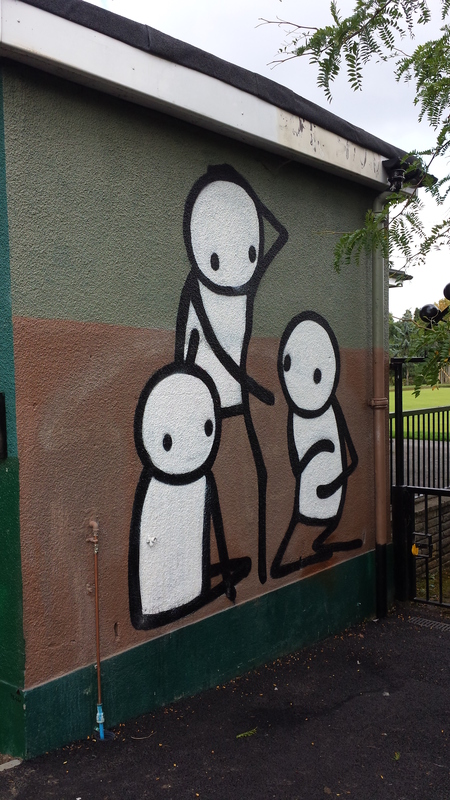 A Stik, which we are told (on the interactive map) interprets Elizabeth and Mary Davidson’s Tily Kettle (which I cannot find on the Picture Gallery website). Oddly though the description for 184 (below) is the Linley Sisters by Gainsborough who happen to be Elizabeth and Mary and more neatly fit the bill. Have a look at the original and make up your mind. Could this be a little confused? 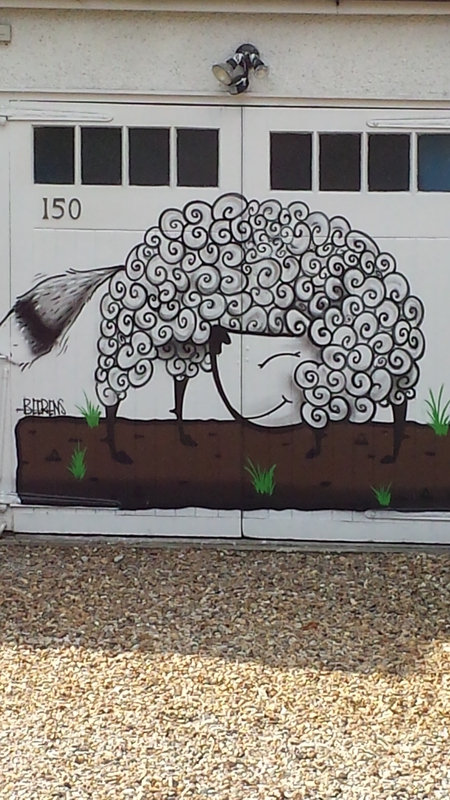 Next is the first of the Sheep created by Michael Beerens also based on the Three Boys by Murilo. The Beerens is spread over three houses, the other two boys (Sheep) are on 173 and 175 (and not 175 and 177 as the interactive map suggests). 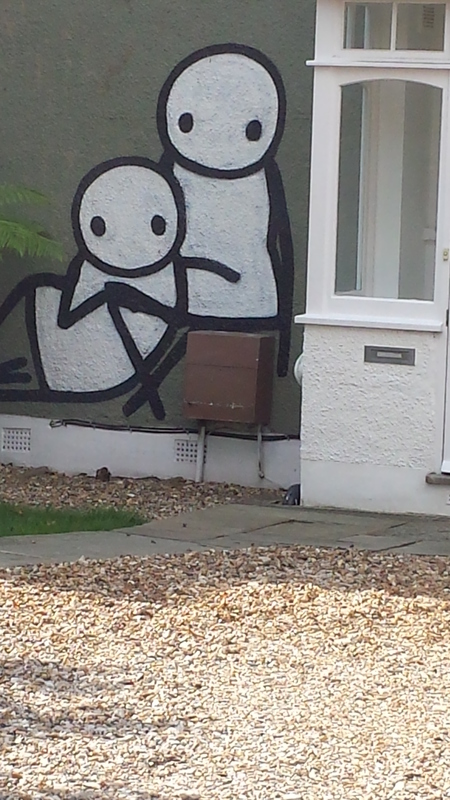 Stik, definitely but interpreting a Gainsborough? 7. 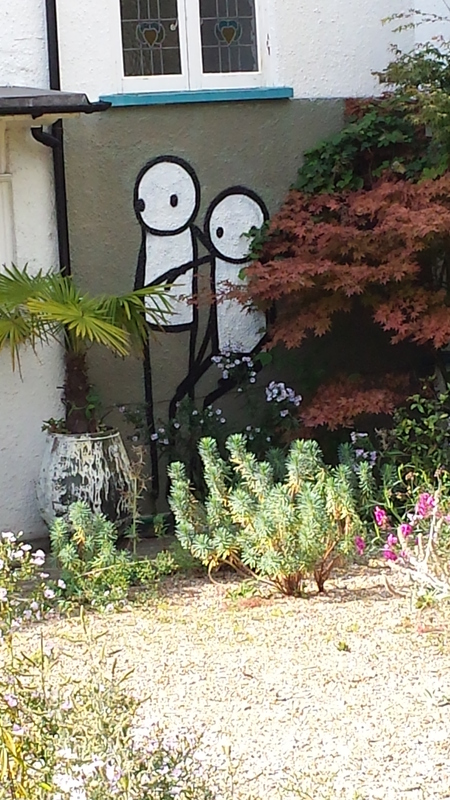 Court lane has one last Stik, at 184. This, we are told, is based on the Linley Sisters by Gainsborough. But see above. Most likely they both are. Maybe it is the second interpretation? 8. From here you continue up Court Lane to the junction with Lordship lane. According to the map you can go right to find a work near the Horniman Museum but as this really Is out of the way and the map suggests you need an appointment we passed this one by. Instead we turned left, towards East Dulwich. By now you will have walked some two and a half miles, starting at Gipsy Hill. If you decide on the bus break from the Paxton then it cuts off a mile. Overall, from the Picture Gallery to Peckham, where this tour ends, it is about 7 miles. Just so you know. Oh and some will wonder at the constant references to cafés and toilets. Well the two tend to be sequentially important and my wise mother’s words have increasing relevance as I age: ‘never pass a toilet’. Oddly she never said the same about a cafe but then again cafés back in her day weren’t as common and eclectic as today’s selection. 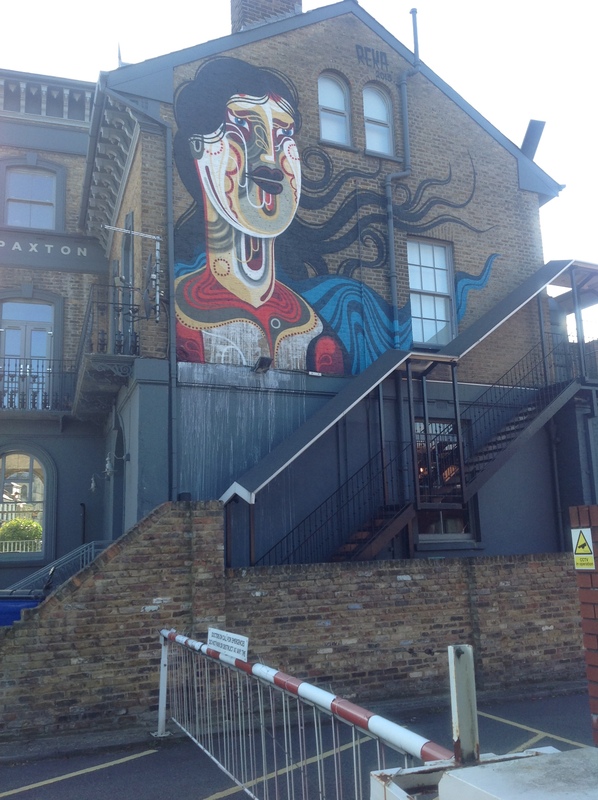 This entry was posted in art, buildings, Dulwich, London, miscellany, sculpture, street art and tagged Ben Wilson, Dulwich, Dulwich Picture Gallery, MadC, Michael Beerens, Patrick Delgardo, Peckham, Reka, Stik, Street Art, Thierry Noir. Bookmark the permalink. What a wonderful stroll! The art interpretations of different masters is a fun way to get people engaged (and touring local neighborhoods). But who’d steal a modern statue? It’s a good thing to list cafes and toilets. Not like northern Idaho where you get coffee at the gas station and drop your britches wherever. I’ll have to counter your post with one on the passing rail art of the Burlington Northern Santa Fe. Look forward to that Charli. 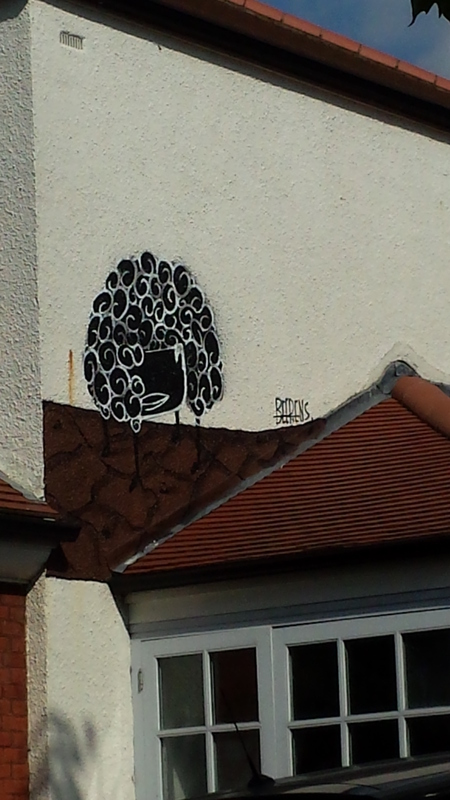 My sort of day – train journey plus street art equals ambrosia. The gentleman in the picture with Darwin and Linneaus is, of course, the amazing Alfred Russell Wallace. The man who discovered the Goldilocks zone and proved that the Earth wasn’t flat. Also why shouldn’t you mention Crick & Watson? Vinnie has rather strong views on the subject, seeing them as misogynistic charlatans with the hard graft and genius coming from Wilkins and Franklin whose pictures are on the first wall. Having stood at the end of his well rehearsed diatribe I thought it only politic to warn off others who may be short of time! More envy from reading your posts. I love art but don’t get to explore it much, unfortunately and haven’t painted for a few years. There were a number of statues in Sydney’s Centennial Park but sadly these were vandalised, stolen and also run into by learner drivers over the years. Most famous of the missing statues was a full length statue of Charles Dickens, which is quite exceptional as he didn’t want his likeness to be reproduced a in effect glorified. I guess once again, the Australians rebelled. 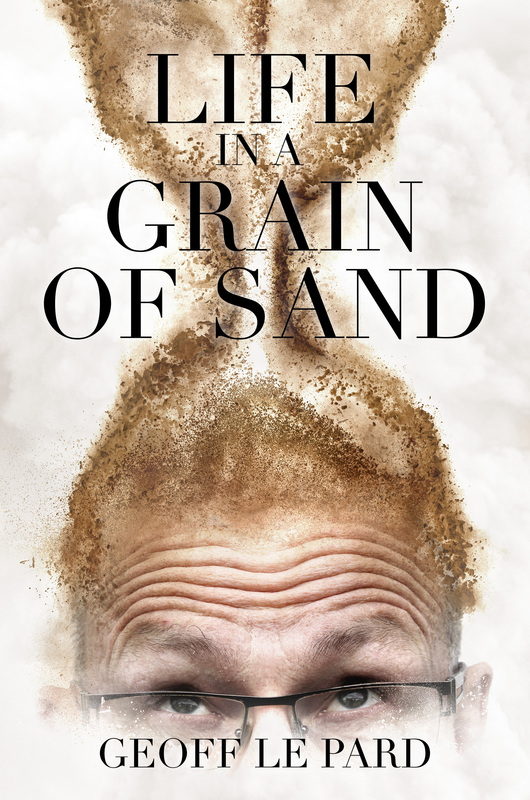 A great story, which reminds me that I’d intended to visit the statue and I wanted Geoff to photograph me writing beside him, although the question is do I write with a pen or have my laptop in hand? Dickens was a mould breaker so laptop. Thank you for the excellent comment and link. My weekly novel – Buster and Moo – is a homage to Dickens. When you make it to London I’ll happily show you some of the wonderful street art. That would be great, Geoff. Perhaps, I’ll have to apply for some kind of blogging cultural exchange grant. I was looking like I could pull off a trip to Ireland and I got sidetracked. Actually, research funds were probably reallocated to scouts. It’s not cheap creating the leaders of the future or just even trying to ensure your kid can find their own shoes, pack a bag and get to the scout hall before the bus leaves. Jonathon was lucky the scout leader was delayed as he gained an extra 3 hours to pack but to be fair, we’d had Amelia in hospital the day befor ein Sydney and he’d spent the day at his grandparents’ so we were all up against it to get the pair of them off for the weekend. Amelia has gone off to a cub leadership training course. Quite a recovery. She might be packet sized but she’s determined. I tell you the boy was pushing my boundaries with his lost shoe. It was harder trying to talk him through his fears of being eaten by a shark while at the Sirius Cup at Balmoral. We were pretty sure that Amelia’s medical tests had rekindled his anxiety about me dying and like a lot of these psychological reactions, they can be quite obtuse to the person concerned and it’s hard to explain what’s going on to them without coming across as uncaring. It’s terrible just how real fear can feel and how it actually almost comes to life gaining arms, legs and of course the head of an ugly, vile beast. I decided to revisit the situation with him when he is not razzed up and see if that’s more effective. It’s a life sentence, parenting, but the delights outweigh the nightmare. At least I hope so! It sounds like you have a great grasp on what makes your darlings tick. Send them a very British Somewhat uptight hug from South London!! I will when all of us return to home camp tomorrow night. I can’t wait to hear what adventures and mishaps have occurred. There’s always a bright spark in every group. There are also numerous stories of bites. Their scout group leader has been hospitalised a few times recently for bites, which probably doesn’t surprise you about the Australian bush. We have nasty ants called hoppy joes. They got her. Jonathon was bitten by a squid when we did clean up Australia Day. He’s thought it was a stingray and we’d thought he was dramatising things again but the scout leader recognised the squid’s tentacle prints. They’ll have to give you a scout handshake! The first time someone tried one of those with me, I really didn’t know what was happening but I’ve been initiated now. we never had handshakes! Can’t wait! Our scouts seem to shake left hands. It took me aback the first time because I come from a world where secret handshakes are not a good thing. Yep, I think he’s great too.